“The first ever dental aid mission to come to Jenin. Led and co-ordinated by seasoned dental aid deliverers Asid Khan and Imran Gill.The above paragraph defines two clear points, both which gave me minor anxiety. We are the first team (Pressure much? ), and with seasoned clinicians (Going to get schooled). These were the thoughts that briefly entered my mind as we meandered over some breathtaking views of the Sahl Arraba Valley. Soon displaced by the early morning excitement and buzz from Team DAN 2017. A good mix of people but great to see so many young dentists. We entered a single surgery clinic which had kindly been provided for us with the help of the PCRF in the heart of the hustle and bustle of this city. A waiting room full of children with their parents waiting to be seen. We were joined by a wondeful local Dentist Maryam and a very helpful dental assistant volunteer who also doubled up as translators for us. The brief was clear and off we set. We began to get a feel of the clinic and then everything began to fall into place. The main objective was to screen the children on day 1 and apply fluoride and OHi in order to plan treatment for the next 3 days clinics. However as we were ahead of schedule we decided to begin some treatments. Fissure Sealants, Fillings and extractions. Some of the children were excellent, and a big sigh of relief to know a GA referral pathway was present for the most anxious. It was busy and the whole team including the admin team did a wonderful job. Handing out toys and seeing the smiles made a huge difference. To finish knowing we had worked hard and the challenge we had set ourselves for the week created a buzz. The blessing was having helpful people such as Maryam and the social workers so all teams could communicate effectively. Good Job team, high fives and smiles all around. Time to reflect as a breathtaking sunset falls at the hill tops on the journey home. I mentioned at the start 2 clear points which made me nervous. The unknown can do that to you. Today I realised that the experience was what was required and rather seeing experience as a threat. Experience became my mentors, which also helped me conquer my fear of the unknown of going into a city to provide treatment for the first time which was also the case for Maryam. On reflection the skills we have can make such a huge difference. A small help can go a long way. Today I hope we were the start of a new chapter for that difference, and long may it continue. “Having been following Dental Aid Network on Facebook for a while, I would always enviously look at the pictures of DAN’s missions, particularly the trip to Palestine. This year I was fortunate enough to join the team! I was asked to lead the team in a town called Salfeet. Dr Jaber kindly allowed us to use his surgery for the week in order to treat the underprivileged children in the area. We have been inundated with high treatment need patients. Lack of dental education is clearly an issue which we addressed early on in the week with an interactive oral hygiene and health talk with the kids by Dr Mustafa Makda (uk) and Dr Majd (Palestine). The following days have been crammed with treatment consisting mainly of extractions, and also fillings. What is always striking is the sheer strength and bravery of such young children. They were a pleasure to treat, and also have a bit of a laugh and joke with in between treatments. My team also managed to successfully treat some difficult special need patients who had been refused treatment elsewhere, so well done to Dr Mustafa Makda and Dr Jamil Jeeva! Dr Saira Akhtar Gill, Team Palestina 2017. “Today I worked in nablus, a city that has remains dating back more than 5000 years. Even the clinic we worked in was historic and absolutely beautiful. We saw 21 cases today. Some really difficult as they had never seen the dentist before and so extremely anxious. My highlight of the day was simply making a nervous little girl laugh at my terrible arabic. I kept referring to her as a boy! She let us complete all the planned treatment and she left smiling. Hands full with toys donated from the UK. Reflecting on my trip so far, my most rewarding experience was actually just simply giving ohi/tbi to parents. We talked about basic things such as snacking and it felt promising that they interacted and genuinely wanted to learn. I pray they benefited somehow. When I booked this trip, I had absolutely no idea what to expect or who else would be joining me. I needn’t have worried as I feel like i’ve made friends for life. The bonds you make on this mission is like no other. You’re all there for the same reason and you just jump into everything like a family. It’s now been 7 days into our trip and I can’t believe it’s close to ending. If I could, I would happily stay another week. We’ve met some incredibly brave, genuine sincere people. People struggling in life for many reasons and yet showing dignity that we could never achieve. It’s really hit home how incredibly blessed we are back home. Dentistry at home can be rewarding but oftentimes can be stressful too. When you come on a trip like this, you fall in love with dentistry oncemore and thank God that he has enabled you to help even if it’s in a very small way. You genuinely get more out of it than any of your patients. You wake up excited and you end your day wondering how you can do more tomorrow. I’m sad to say tomorrow is our last working day. But I know I’m going home a different person. I definitely want to be part of the DAN family and I hope I can continue to help out in future. “I was fortunate enough to be on the Dental Aid Network’s Palestine mission this year and it has been above and beyond what I had hoped for. Today I was based in Qalqilia, one of the neighbouring regions in West Bank, with Dr Taiyyub and Dr Fahim where we had the pleasure of treating some of the bravest and happiest children. Having had some delicious fresh za’atar bread with hummus and Arabic coffee for breakfast, we arrived to a busy waiting room. Our day comprised of fissure sealants, hall crowns, fillings and extractions but the main objective was to give these patients OHI and dietary advice. Lack of dental education and the resulting neglect was evident as all the children had high caries rate with some needing multiple extractions. Most of our patients did not own a toothbrush or hadn’t brushed in a month but with the help of kind donations from the UK, we were able to send every child away with a toothbrush and toothpaste along with some toys. Earlier in the week we met with the mayor of Nablus and local social workers, introducing them to the successful Childsmile programme model in Scotland. Our aim was to make the local schools introduce oral hygiene and regular tooth brushing to children and to train the social workers already working in the area to provide support and dental education to the families. This is with the hope that we can make an impact far greater than any one aid mission could ever hope to achieve. This was also the first time that I visited Jerusalem. A blessed city that is important to Muslims, Christians and Jews alike and it has a vast history dating back to the Romans. We were lucky to be introduced to an absolute inspirational woman who has fought for the rights of vulnerable people her whole life and she gave us a detailed tour of Al-Aqsa mosque and the old city. We were very fortunate as she introduced us to the local families living there and we saw first-hand the incredible struggles and obstacles they experience daily. It was heart-breaking to see the hospitality and open heartedness of the locals despite living in incredibly difficult and poor living conditions which made me appreciate the blessings we have back home. We had entire families living in a room smaller than my bathroom, yet they would host us with humbling generosity. “The time I have spent here has been truly eye opening for a number of points. From our viewpoint in the West it is very easy to become desensitised to what happens elsewhere. Indeed we may even throw a few pounds into a charity bucket and think that we are doing our part and give ourselves a pat on the back. However, seeing first hand whole families living in a single room truly strikes home how fortunate we really are. We have seen patients who are: deaf/mute, suffering from Down syndrome, from orphanages, suffering from learning disabilities. Treating such patients not only highlights the difficulties some people face but allows us to show gratitude for all we have. We are lucky to have in place a system in the UK where those who are in need are still able to access dental care, to seek treatment to alleviate pain and be able to eat in comfort. However, many here are not in that fortunate position and a simple filling may amount to a quarter of a families monthly income. As such, seeking treatment for a number of fillings is out of the question for many people. Quasim Munir, Team Palestina 2017. 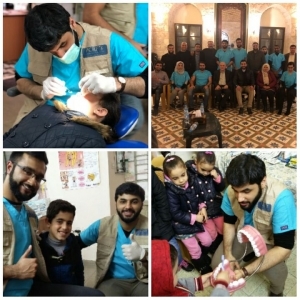 It has been a few days since the team of dental volunteers from Dental Aid Network (DAN) have returned from Palestine. I had every intention of sharing something about the trip, but whenever I have found time to sit down and reflect on the experience, I have struggled to find the words to encapsulate the feelings and emotions that are circling within me. The first part of our journey was spent in the city of Jerusalem – a place that is dear to all three of the Abrahamic faiths. It was heartening to learn of the great respect each of the religions had historically held for each other, demonstrated so beautifully by the wonderful co-operation between the Palestinian Christians and Muslims with regard to the Church of the Holy Sepulchre. This Church is the location where Christians believe Jesus PBUH was crucified, and is therefore the most revered site on earth to them. Due to the esteem the different faiths have for one another, the honour of the daily opening of the Church has been bestowed on a Muslim family – a tradition that still exists to this day. Al-Aqsa mosque holds a special place in the hearts of all Muslims. There is unrivalled beauty in its simplicity, and the tranquility and spirituality one feels whilst worshipping there leaves a profound impression on the soul. We had the pleasure of meeting amazing Palestinian aid workers , one in particular stood out. Her dedication to helping and aiding those in dire need in the Jerusalem via the charitable foundation she and her husband have set up is inspiring to behold. The results of the decades-long conflict are not limited to physical measures like poverty, poor housing, illiteracy, and the daily 2-hour wait at check-points for schoolchildren. The toll these awful acts are having on the emotional and social well-being of the people is immense. The stresses are leading to breakdown in familial relationships, and these are tearing at the fabric of their society. We can help by visiting the region to provide support, and showing them that we care. Our dental mission was organised by the amazing team at DAN, and principally managed by Asid and Mohammad. The Palestine Children’s Relief Fund (PCRF) co-ordinated the clinics on ground through Hana Abdeen and her local team members – Aya, Sawsan, Mona, Mohammad and Fida. They arranged clinics for us in 4 towns in the West Bank; Nablus, Salfit, Qalqiliya and Jenin. They made provision for children from poor and disadvantaged backgrounds to attend the clinics, and our patients also included kids who were living in orphanages, and who had learning difficulties. Dr Jalal, Dr Bashar and Dr Maryam in Jenin. 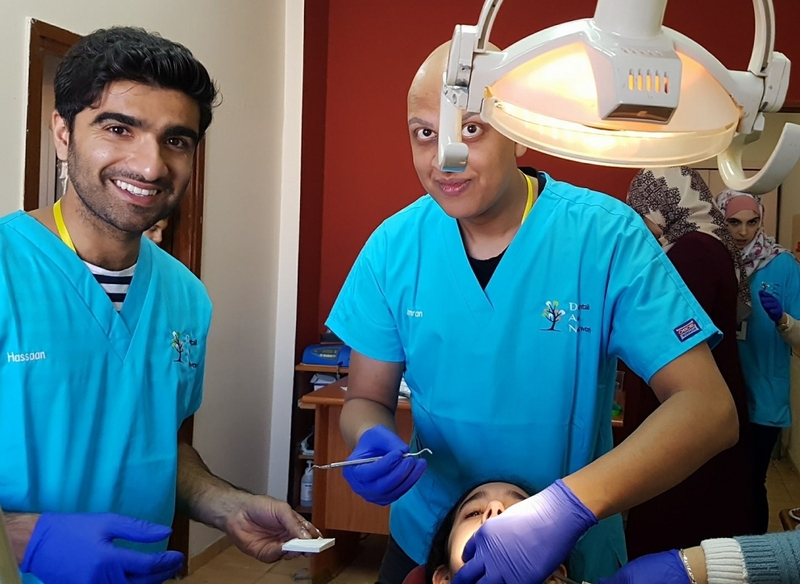 In conjunction with the team of 13 dentists from the UK – and they are all so dear to us that we must mention them – Mohammad, Umer, Shakil, Saira, Quasim, Mustafa, Jamil, Imran, Hassaan, Fahim, Alina and Asid – we managed to examine 344 children and provide treatment to 295. This included more than 450 fillings and 340 extractions, but a large part of treatment focused on prevention of dental disease. This included talks on oral hygiene and diet advice to groups of children and their parents, as well as sealants and application of fluoride. It has been a wonderful trip with so many memories shared with some of the loveliest people one could meet. May God bless all those involved including those supporting the project in various ways from afar, and open our hearts and minds in every way. Taiyub Raja, Team Palestina 2017.